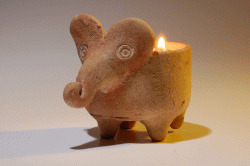 Clay & Wax candle elephant.Approx: 12 cm (5").Clay & Wax candle were used not only for household lighting, but also for funerary and votive purposes. Lamps were used for domestic purposes in homes and for public purposes in temples and most public buildings. By studying the lamp's designs, symbols, structure and decorations, and the material of which it is made, we can identify the age and perhaps the locality of the lamp. The lamp can also give us insights into the culture of its users and their social status.Occasionally the design of the lamps also reveal the female reproductive system. Indian bronze lamps with a protruding central portion are supposed to project the male genitalia on a female womb with light representing 'origin of life' in most cases. In this world of virtual communications and entertainment, children and adults are instantly attracted to ANTIKA, our flagship product. Carried by museums and stocked in hobby shops around the world, one is completely immersed in the world of biblical archaeology. From the time before Herod until the Byzantine Period, Bible Land Shop can supply many styles of oil lamps. Using a simple wick and vegetable oil, the resulting light is romantic and relaxing. * Made and Shipped from the Holy Land * Handmade by a Skilled Potter * High Quality * Best Price Product.